The famous General Trexler Estate at 1227 Hamilton Street is among the best known residences in Allentown. Filled with ornate woodwork, leaded stained glass windows, contemporary lighting and a grand entranceway, coming to the Trexler Home is a unique experience. Next to Christ Lutheran Church at 13th and Hamilton streets, it was built for pioneer industrialist George Ormrod in 1896. The estate is a showcase on what was once known as "Millionaire's Row." It was acquired by Trexler in 1919 and was his home until he died in 1933. After Mrs. Trexler's death in 1936, the Trexler Trust, which administers the General's will, occupied the home as its offices. Following his death in a car accident in 1933, Allentown had never seen anything quite like the funeral for General Trexler. For hour after hour on November 21, 1933, long lines of mourners walked into the reception room of Trexler’s house. A worship service was broadcast to the overflow crowd at Christ Lutheran Church next door. The Ormrod-Trexler home is not particularly large by 19th century millionaire standards. But for residents of the Lehigh Valley, its association with Trexler make it significant beyond its size. In 1993, architect Ben Walbert worked with the former owners of the Marilyn Custom Shop to convert the home to a retail clothing establishment. It included an addition and changes that were in keeping with the spirit and character of the original. There was some discussion in 1993 about tearing the Trexler home down, but city officials and local history groups rallied to save it from destruction. 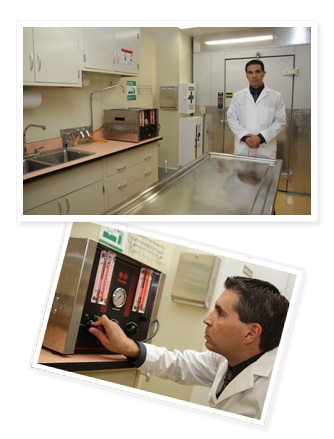 Our preparation room is equipped with modern, state of the art instruments and furnishings, including walk-in refrigeration and an emergency stand-by power generator which can supply the entire funeral home indefinitely in case of an electrical power failure. This way you will have peace-of-mind that your loved one will be cared for at all times, since we are prepared for any eventuality. Nicos Elias has had a desire to be a funeral director in his hometown of Allentown since a very young age. After working several years in his family’s printing business, he decided to return to school and pursue a funeral director’s degree and license. In 2000 he earned an Associate’s Degree from Northampton Community College and has been working in funeral service ever since. 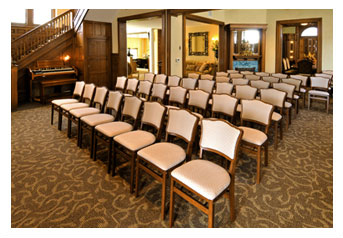 He has spent nearly a decade with widely respected funeral homes in the Lehigh Valley, and is also qualified to provide guidance in the matter of pre-planned funeral services. Now fully experienced in all aspects of funeral directing and many different cultures and faiths, Nicos is enthusiastic about being a business owner. Nicos looks forward to serving the area with respect, love and care. It should be noted that Nicos’s parents, Christ and Theophele Elias, are to be recognized for their support and that this business would not be possible without their help. 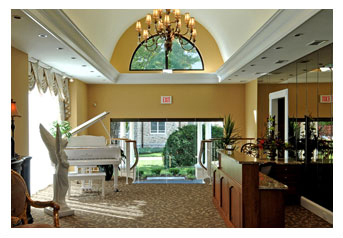 Mr. Elias has been creating oil paintings for decades and some of his artwork is visible throughout the funeral home. 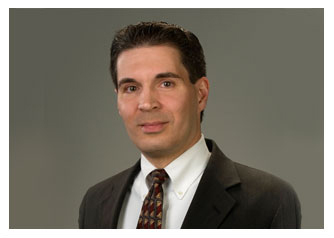 Mr. Elias prides himself in taking care of all aspects of the business himself in almost every case. All technical work, including cosmetic and embalming procedures are handled personally, so your loved one is not at a separate facility or cared for by inexperienced persons. He has many years of experience handling these aspects of the business, as well as making arrangements with you and directing the funerals. You can also see that we take pride in keeping our preparation room immaculate and highly polished at all times.